I'm a huge fan of Ragnar Jónasson's Dark Iceland series. And there's no doubt that Blackout is his darkest book yet. This is actually set between the two previous books - Snowblind and Nightblind - and shows that the author is an incredibly versatile writer. All of the Dark Iceland novels read like old-fashioned whodunnits set in modern times. But they're certainly NOT formulaic, as each book has given me a completely different reading experience. While reading Blackout, I felt like I was among old friends, with the book's familiar characters and location. Siglufjordur, where the series is set, is a small close-knit and somewhat claustrophobic community, where everyone knows one another and many of the locals are related. 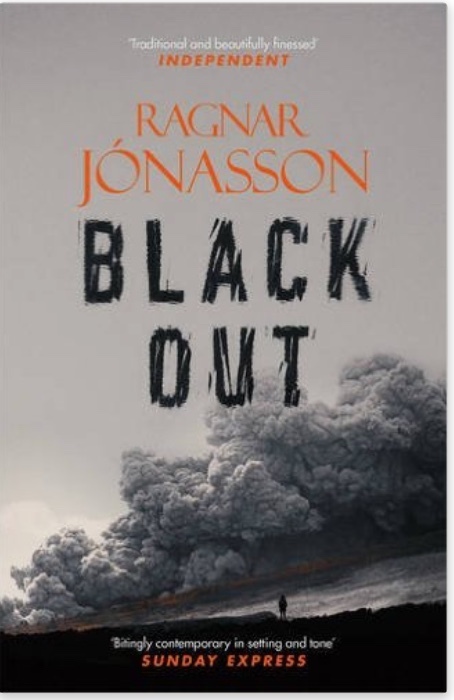 Blackout is set in 2010, right in the middle of the volcanic ash cloud disruption to European air space. This provides an even darker setting than usual and gives the author plenty of scope to write his stunning, vivid and very atmospheric descriptions of the Icelandic landscape. Local policeman Ari Thor and his colleagues are investigating a brutal murder that took place on the shores of a fjord. Ari Thor takes less of a major role in this book, as a young reporter is conducting her own investigations into the identity of the killer. He's distracted by problems at work and those on the domestic front, fighting his own demons and making some highly rash decisions that he could regret later on. The plot of Blackout is far more complex than that of the previous Dark Iceland books, with various different strands that at first seemed unrelated. The suspense and intrigue built up gradually with many surprises along the way. And as the jigsaw pieces slotted into place, there were several breath-holding final chapters. I couldn't wait to read Blackout, so bought it soon after the ebook release. The only drawback now is that I have to wait until Spring 2017 to read the next book, Rupture. Looks like I may have to read all three of the current books again to tide me over until then. I've just downloaded and started this and can't wait to have the time to settle down and really get stuck into it! Im a big fan of Nordic noir generally and am so glad I discovered this series. Absolutely love Ragnar Jonasson's writing! !